Long, long time ago, there lived a brother and a sister. Their parents died when they were little. The small girl took care of her younger brother like a mother. One day, the boy asked his sister to take him to the forest when the sister set out to collect some wood for the kitchen. 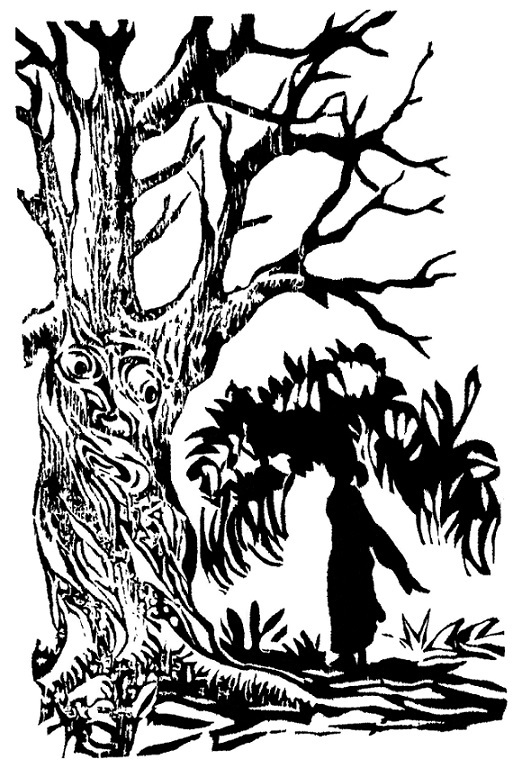 When they reached the forest, the sister sat her brother beneath a big tree while she collected the dry branches into the basket she carried on her head. While she was busy, a demoness saw the little boy. She kidnapped the boy and took him to her place, deep in the woods. When her basket was full, the sister came back for her brother. But alas, her brother was not there. She looked around and called him at the top of her voice. But there was no reply. The sister resolved that she would not return home without her brother because she knew he could not have gone back on his own. She decided to go deep into the woods in search of him where there were no human habitation as the place was full of magic, and everyone was afraid to go in there. On her way, the sister came across a very dense wood. To her great surprise, there grew a huge tree with not a single leaf on it on her way. On hearing this, the girl took out her knife and poked the soil beneath the tree. Suddenly, an insect hidden in the soil came out and flew away. Then in front of her very eyes, the girl saw tender shoots coming out of the barren branches. The tree rewarded the girl with a magic stick: 'Touch anything with this stick and make a wish. And it will come true.' The girl thanked the spirit tree and resumed her journey. 'Little girl, I'm the strongest man on this earth. But a small insect which has got into my eyes has blinded me. Now I'm beaten by a small insect,' replied the man. 'Don't worry sir. I will cure you,' assured the little girl. Then the girl took out her magic stick and touched the man's eyes with it. Then the man was able to see the world again. He was overjoyed. 'What brings you here little girl? Everyone is afraid to come to this part of the forest?' asked the man. 'I have come here looking for my younger brother,' said the girl. The man knew at once what must have happened. He asked the girl to sit on his big palm. Then he flew to a cave where the demoness lived. The girl took out her magic stick and touched the man. The man became quite small to be able to enter the cave. Both of them walked into the dark cave. Inside the cave, they found the boy lying unconscious. The sister touched her brother with the magic stick on his head and he regained his consciousness. The three evaded her and ran out of the cave. The demoness followed them. But by the time the demoness came outside the cave, the man had resumed his original size. The man and the demoness had a fierce fight. The man held one arm and one leg of the demoness and tore her body into two pieces. She died instantly. The man then took the brother and sister on his palms and flew them to their house. With the help of the magic stick, the brother and sister lived like king and queen happily ever after. This article was webcasted on June 26, 2018.